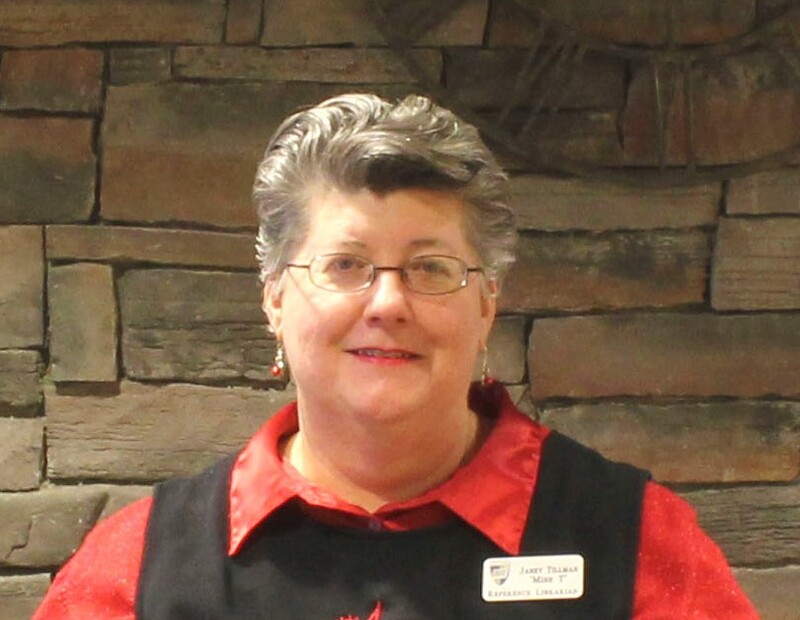 Links to Online Databases as well as research skills instruction available. Coverage includes more than 153,000 theses and dissertations from 1902 to the present as well as links to access the full text, when available, via the Institutional Repositories where the theses or dissertations are housed. A free resource accessible to all researchers, American Doctoral Dissertations is available on the EBSCOhost® platform, and the content is available via EBSCO Discovery Service™. ePlace is a digital collection of research and writing produced by the faculty, staff, and students of Asbury Theological Seminary. Managed by the B.L. Fisher Library, ePlace is designed to promote the open access of material from the Wesleyan and Holiness traditions to be shared with a global audience. It also serves as a place to preserve rare and difficult to locate material and encourage academic research and ongoing dialog between scholars in the field..
Overviews of recently defended, unpublished doctoral dissertations in a wide variety of disciplines across the Humanities and Social Sciences focusing on the window of time between dissertation defense and first book publication. Each review provides a summary of the author’s main arguments, the historiographic genealogy in which the author operates, and the main source bases for his or her research. The reviews are also anticipatory, making educated assessments of how the research will advance or challenge our understanding of major issues in the field when it is revised and published in the future. Electronic Theses & Dissertations Center Description of this database. Electronic These Online Service provides access to the full text thesis of all UK doctoral theses, either via download or digitisation-on-demand. A national aggregated record of all doctoral theses awarded by UK Higher Education institutions with free access to the full text of as many theses as possible for use by all researchers to further their own research. Networked Digital Library of Theses and Dissertations: open-access electronic theses and dissertations. An international organization dedicated to promoting the adoption, creation, use, dissemination, and preservation of electronic theses and dissertations (ETDs). A free repository of theses, dissertations, and other academic documents. RIM by ATLA is a database of indexes and abstracts for doctoral projects and theses from programs accredited by the Association of Theological Schools (ATS). RIM®) indexes and abstracts projects and theses from over 100 Doctor of Ministry (DMin), Doctor of Missiology (DMiss) and Doctor of Educational Ministry (DEdMin) programs accredited by the Association of Theological Schools (ATS). It is a searchable database with entries for authors, titles, thesis/project advisors, schools, and ATLA subject headings. Abstracts can be searched by keyword. Links have also been added to records for schools that also participate in the Theological Research Exchange Network (TREN). A comprehensive collection of Canadian theses at Library and Archives Canada (LAC). Provides free access to as many Canadian electronic theses and dissertations as possible and also provides access to non-digital theses in the collection of Library and Archives Canada via interlibrary loan or sale. A comprehensive collection of dissertations and theses from around the world. Students, faculty, and other researchers search the database for titles related to their scholarly interests. You may purchase either unbound, shrink-wrapped print copies or PDF files. All dissertations, theses and published material based on theses cataloged by OCLC members, including all subjects. Over 8 million records in the database. Dates of coverage include all cataloged dissertations, theses and published material to the present. Updated daily. 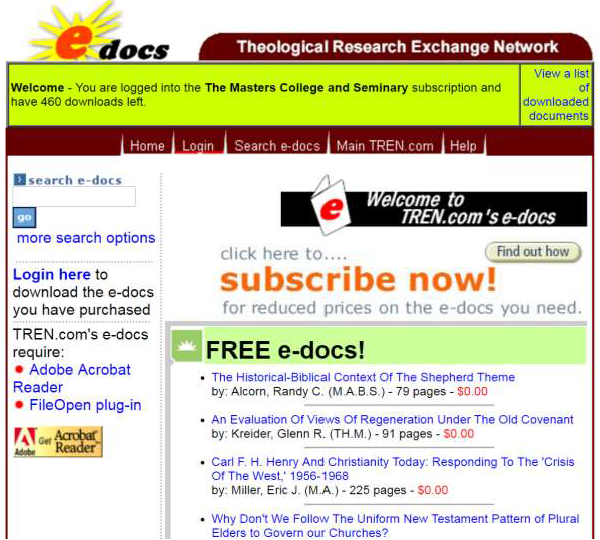 Theological Research Exchange Network or TREN is a database of theological theses and dissertations. Many of the TMS theses and dissertations are contained in TREN and those that are available as electronic documents (edocs) can be downloaded for free by TMS faulty and students on or off campus* These edocs can be found by searching TREN using the School name. First, go to the Online Indexes to Theses & Dissertation box on this page and select the link to TREN. Second, select the link to edocs: . Third, select "more search options" (top left). See Figure 1. Fourth, select "The Master's Seminary" from the "School" drop down list and Search. See Figure 2. You will retrieve a list of all of the Master's Seminary theses available to download for free. * Notice the green banner (Figure 1). * Only authorized TMS users may download these edocs for free. For off campus user, when prompted use the same id/password used to access your TMS Self Service account.